Lizzie is in the House! Lizzie’s custom pet portrait is in process. Once I get close to finished with a portrait, the sweet puppy or cat moves to my kitchen counter where I study it for a day or two. What am I looking for? Is there anything that bugs me when I look at it next to the photo, do I see something that I want to change? In Lizzie’s case, I think she needs a little brown piece at the bottom of her white beard on the left and I am going to layer in a little bit of black glass in some of the lighter areas on her ears. I think it needs a little more shadow. Once I make those changes, I will send a photo to her mom and dad so they can see if they see anything that needs to be changed. The pink glass is there because I am trying to decide which one will work best as her background. Any suggestions from you guys? I will be back in the next couple of days with the finished portrait so you can see what she looks like in all her glory! 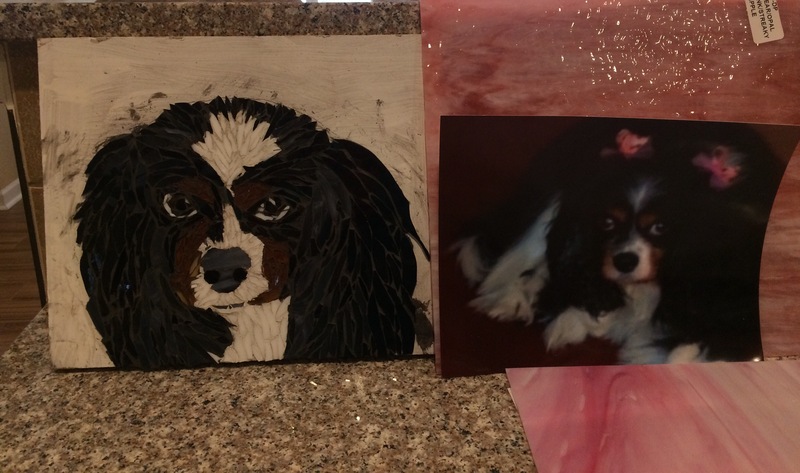 If you are interested in a mosaic pet portrait of your fur baby, click Here.